Building electrical systems are typically invisible and its occupants are more focused on their facility’s layout and appearance. However, if those electrical systems aren’t designed and operated correctly, it’s possible to experience a deadly event known as an arc flash. 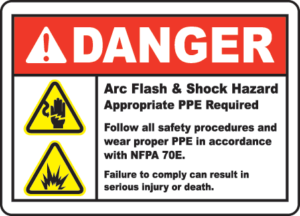 So just what is an arc flash? Technically it’s exactly what it sounds like – an electric arc that’s formed in the gap between two electrodes. It can happen with any sort of electrical panel, often those that look perfectly ordinary. They can be initiated in several ways, the primary ones being accidental contact, corroded or deteriorated equipment, and the use of equipment which is underrated for the available short-circuit current, said Jason Blubaugh, director of FSB’s Electrical Engineering Department. Without proper protections in place, arc flashes can and do cause significant injury, death and property damage, with approximately 30,000 incidents occurring in the United States each year, according to OSHA statistics. The good news is that the dangers of arc flashes are being addressed in a much more proactive fashion, through the medium of arc flash studies performed on new and old facilities, Blubaugh said. These studies reveal any potential hazards and then address those risks in several ways. What an arc flash study does is specifically identify how much energy is available at each piece of electrical equipment. This includes panel boards, distribution equipment and whatever additional areas where workers will be performing maintenance. Key factors that are taken into account are the size, amp and rating of the equipment, the distance between control panels, wire size and how much energy is available from the utility company. Once a study is complete, two steps can be taken. First, warning stickers are posted on potentially dangerous equipment to let individuals know how close they can approach before they need to take additional precautions. These precautions take the form of personal protective equipment (PPE), which typically includes a combination of safety goggles, face shields, rubber gloves with leather protectors, insulating sleeves, hard hats, rubber work boots or overshoes, hearing protection and flame-resistant clothing. The second step is to take the arc flash study information and modify “upstream” electrical equipment to reduce the energy level at the site in question and achieve compliance with strict OSHA codes. Arc flash studies are becoming more common, and at FSB they are a routine part of any new building design. “We have multiple electrical engineers on our team who are experienced in this area,” Blubaugh said. “We’re also doing more and more of them on existing facilities and renovations, since most older buildings did not have these studies performed at the time they were constructed. Now the owners are asking us to go in and perform the evaluations in order to protect their workers. To learn more about arc flash studies and how they can benefit you, contact Jason Blubaugh, Director of FSB’s Electrical Engineering Department, at jblubaugh@fsb-ae.com or 405-840-2931.